I find varying accounts of his works. The most lionized was a biography sponsored by the Pennsylvania Slovak Union; written by Stephen J. Palickar in 1950. Palickar was a Slovak nationalist who wrote frequently of their culture past and present. I am not saying that he's an unreliable source. I'll quote Regan; "Trust but verify." The facts are that Murgas was born on February 17, 1864, in the Tajov, Slovakia and studied the wireless telegraph on his own while in seminary before he came to America. He was a bit of an autodidact, his technical knowledge all came from his own studies. He was experimenting with wireless in the basement of the seminary in 1898. He was strongly interested in painting, botany, electricity, and of course Catholicism. 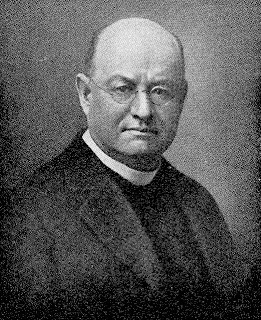 In 1896 he came to Wilkes-barre, PA to establish a parish. He continued his radio experiments almost immediately. Murgas had read the 1888 paper by Hertz that described the transmission of radio waves through the "ether." The paper was wrong of course, but not so wrong that it stopped Murgas or even Oliver Lodge from transmitting radio waves. Marconi was at work with his first transmissions in 1895 with little disagreement with Hertz so there was little reason it should stop Murgas in 1905. In 1904 Murgas got the first two of his eventual 13 U.S. patents (759852 and 759826.) He formed the Universal Aether Telegraph Company to raise funds for further experimentation. The Electric Signal Company, of Philadelphia was an investor. It's president Mr. Joseph F. Stokes has a keen interest in the experiments. Murgas erected a 73 watt transmitting station in Wilkes-Barre and a receiving station in Scranton, PA. The Early Radio history website has a great article on this. Josef began public demonstrations in 1905. Fred Kirkendall, then mayor of Wilkes-Barre, transmitted a message in Morse code to Mayor Alexander R. Connell of Scranton. The antenna is composed of 10 cables made of No. 10 B. & S. stranded, well-insulated copper wires. Each cable hangs from a separate insulator of particularly well-insulated construction. Each insulator is a rubber rod 30 in. long and 1.5 in. thick, with outer petticoat tubes of polished hard rubber. The insulation of the antenna cables is practically perfect, hanging as they do from a cross rope connected to the top of the mast arms. At a height of 30 ft. from the ground all of the cables are fastened to another cross rope attached at each end to a 150,000-volt insulator, and from that point they are gathered in a bunch and brought into the operating room through a hole in the center of a square plate glass window. One article wrote that he used the "Slaby-Arco system" for his tuner. thsi was not off-the-shelf hardware, it was more like a kit that required you make half the parts yourself. 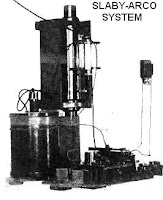 More importantly, the Slaby-Arco system was not just a tuner, it was a transmission and reception pair made for the wireless in 1901. If he was using that name-brand wireless set in 1905, he didn't invent it. None-the-less when reading his patents, they make more sense in terms of modifying Slaby-Arco hardware. If these modifications were patentable, they may have contributed to the cannon so to speak. His spark gap transmitter for example, was mounted in some kind of spinning barrel that alternated carbon and iron contacts. I think this may have been used to control the timing of the sparks, like a long series of dots in Morse code. And he does refer to it as a "rotary spark gap." He claimed it raised the frequency of the spark audibly. He was trying to make a continuous signal from a quick succession of sparks over one long spark. There is actually some logic to this. He patented that rotary transmitter in 1903. But the patent itself describes it as "imperfect." He was able to modulate this to broadcast both a high and a low tone. His idea was that these could be controlled to alternate like a dot and a dash. Skilled operators could transmit messages at about 40 words a minute. Supposedly Edison even came down to inspect his apparatus as did Marconi. But in late 1905 gale force winds destroyed his towers, the 50 foot masts collapsed. He needed more money to continue his experiments with radio. His telegraph company was now selling public stock so the funds for this were on hand. Murgas went on to attempt to conduct signal through the earth itself which failed miserably. This seemed to be the turning point. The parties that his investors thought would extend further funding such as the U.S. Navy did not. He filed a few more patents after this but largely faded from public view. He died in 1929 after a fishing trip. His legacy lived on though, one of his assistants, John Stenger went on to found WBAX in 1922 which still broadcasts today on 1240 in Wilkes-Barre. So you don't like Jozef Murgas. Well, your version of the facts of Murgas's life contain errors and inaccuracies. Please give Murgas credit for the ground-breaking work that he did do. This work, and the fact that Murgas sold his patents to Marconi enabled Marconi and others to build on Murgas's work and get us to where we are today. You would do well to show some gratitude to Murgas and learn from his example of humility. Humility is irrelevant. We deal only in engineering fact here. Murgas duplicated the efforts of some radio men that preceded him and innovated some things that didn't work or worked badly. His work is strictly from an engineering standpoint ancillary to the development of radio. ...Which is probably why his investors left him. He's a historical novelty. If he made real contributions, they were in other arenas. WBAX is still on the air, but broadcasts on 1240, not 1210. 1210 is used by WPHT (formerly WCAU), a 50,000 watt station in Philadelphia. WBAX operates as a satellite of WEJL in Scranton, carrying an all-sports format. 1210 corrected to 1240, Good catch!